Video tutorial: Tips from an Adobe expert on how to create an expressive portrait in Photoshop. As part of its Hidden Treasures of Creativity project, Adobe transformed the centuries-old paintbrushes used by Edvard Munch into a set of free Photoshop brushes and is offering them to Creative Cloud users completely free: download your brushes here. To help you make the best use of these brushes and channel your inner master painter, Adobe has also put together a series of video tutorials. The first tutorial (watch here) explains how to get started with digital painting in Photoshop. 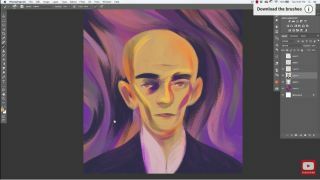 In the second tutorial – which you can watch below – award-winning Photoshop brush maker Kyle T. Webster shows you how to create an expressive self-portrait using Munch's original brushes.